- Patron saint of the Holy Souls in Purgatory. WE ALL HAVE DECEASED LOVED ONES. SOME OF THEM ARE IN HEAVEN, AND OTHERS ARE STILL IN PURGATORY. 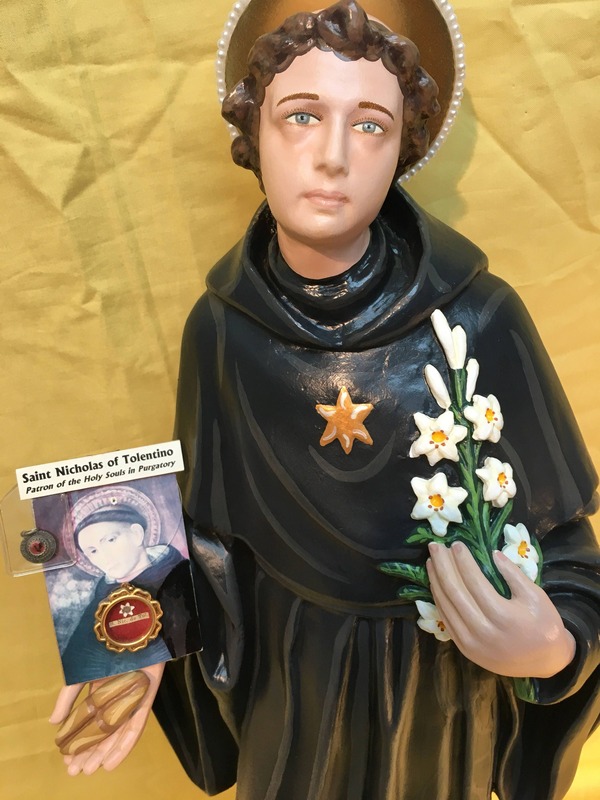 PLEASE PRAY TO SAINT NICHOLAS OF TOLENTINE TO INTERCEDE ON THEIR BEHALF. FROM WHAT WE HAVE BEEN TOLD, THEY ARE SUFFERING SO MUCH BUT CAN'T PRAY FOR THEMSELVES. SAINT NICHOLAS IS THE PATRON OF THE HOLY SOULS. HE IS WAITING FOR YOUR PRAYER REQUESTS WHICH HE WILL BRING TO JESUS. 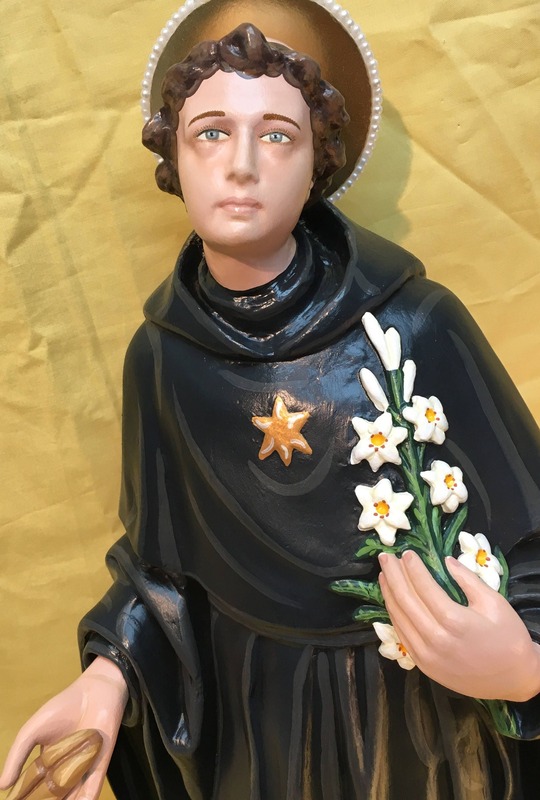 This handsome 26" statue features hand painted face and details such as fingernails and eyelashes, and golden halo. He holds a loaf of St. Nicholas blessed bread in right hand, the lilies of purity in left hand. The guiding star to Tolentine shines on his chest. 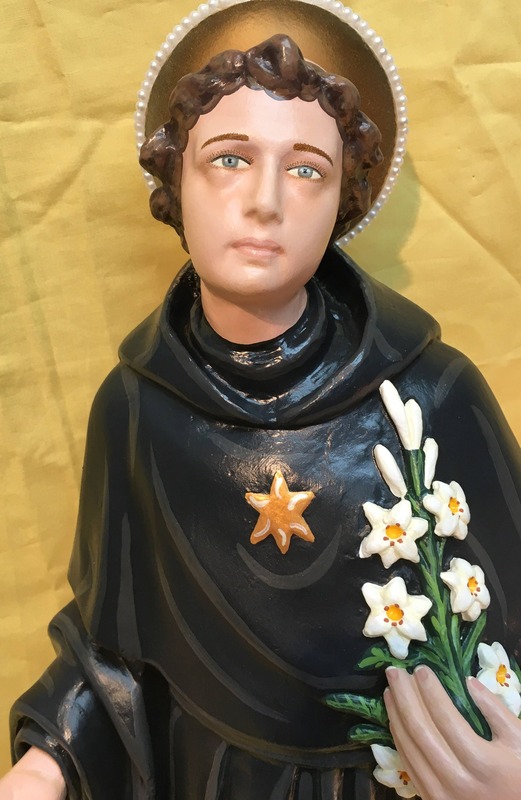 We will also touch a 1st class relic of St. Nicholas of Tolentine to your finished statue. All our statues are handmade in the USA. Please allow 5-10 weeks for us to make the statue and to ship. Beautiful and unique statue: I love it! This statue is absolutely exquisite! It arrived so perfectly packed and the quality of the hand painting is truly beautiful. I am beyond happy with it. I most highly recommend this fabulous company and it’s wonderful proprietors. God Bless you abundantly and again, a million thanks!